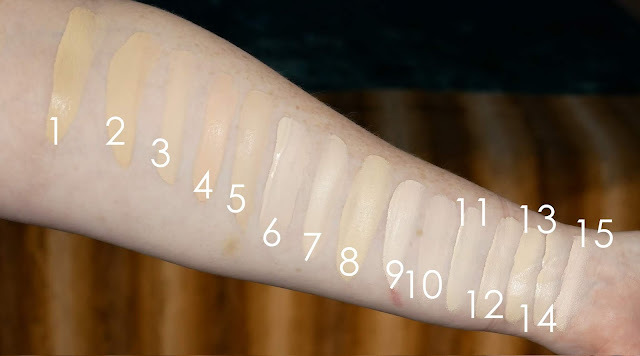 Hey guys, new foundation review for you with some swatches! I've had a little trouble with this foundation, it isn't my best wearing but not nearly the worst either. It's a little peachier than I expected, but still a very good fair shade. I have wet and mostly dry swatches for you today. For reference, my best color matches are Colourpop No Filter Foundation in Fair 05, Clinique Even Better in Shell CN 0.5 and I think maybe even this Smashbox shade! None of these foundations darken much after they dry, I think the NYX is the most noticeable but it doesn't go orange by any means. The Smashbox takes a long while to set on my skin, probably about 1-2 hours. More details in my video below! Here's my video with a demo, lots of information about application/wear and a 13 hour wear test.